6 «" x 5 «" x 2"
The Kumiki Airplane shape brain teaser wooden puzzle contains 11 non identical pieces that designed to resemble a airplane. 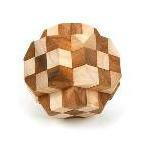 In Japanese the word kumiki means "joining wood together" and refers to varieties of wood craft. 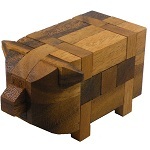 In the puzzling world it refers to 3D interlocking wood puzzle that resembled a familiar shape like buildings, vehicles and animals, not just abstract shapes like spheres and cubes. Tsunetaro Yamanaka (1874-1954) from Japan was the first craftsman to develop the figural wooden interlocking puzzles known as kumiki.